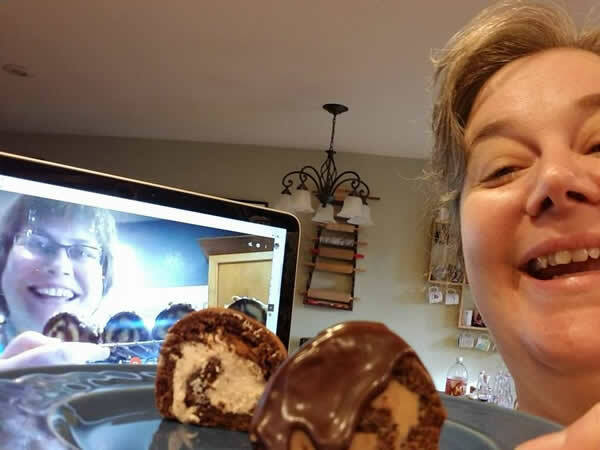 Today is National Cream Cheese Brownie Day, but I’m not actually going to talk about that, because there won’t be any of those in this house. 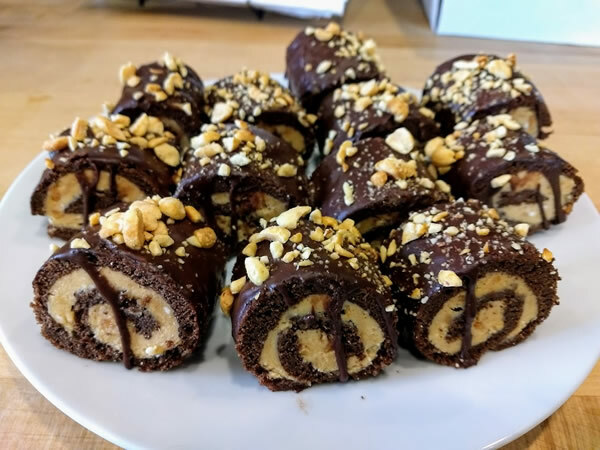 Not that I have any issues with Cream Cheese Brownies – they are quite tasty – but because today was this month’s #BakingSisters day, so instead of doing the National Day thing, we made mini Swiss rolls. Originally we were going to use this recipe, which was used in a Technical Bake in the most recent season of Great British Bake Off, but then I went a-Googling, and found some other options, and so instead, I used the cake from this recipe, and the filling and ganache from this one. I do love peppermint and the thought of peppermint cream inside tiny little chocolate cakes sounded delightful but that was going to end up as an awful lot of peppermint for the weekend (spoilers! ), so I went with peanut butter instead. My pastry-chef-by-training sister recommended that a sponge would be a better option than the cake we’re more familiar with in America, so we started with that. You mix eggs and sugar over a double boiler until the sugar is dissolved, and then decant that into a mixer and whip until it’s pale yellow and fluffy. Then you carefully fold in a mix of flour, cocoa, and salt, and also some melted butter. 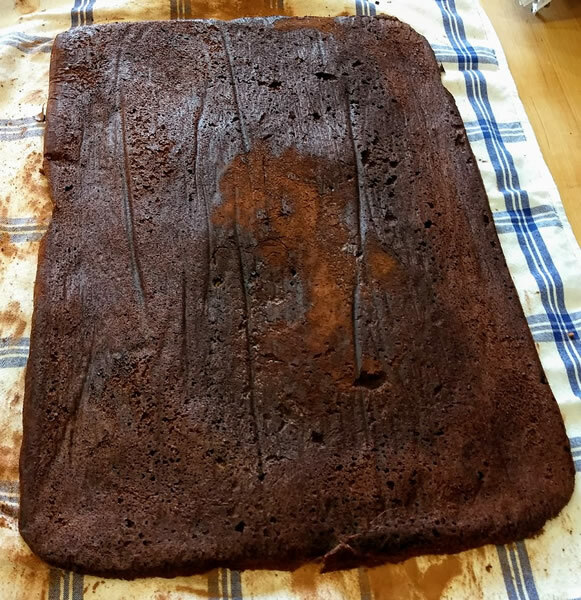 I was *so* careful when folding (I’ve seen enough people on GBBO fold too quickly and lose all their volume) but my batter still shrunk a lot by the time I was done, so maybe I didn’t get the egg and sugar mix whipped enough to start with. Who knows! 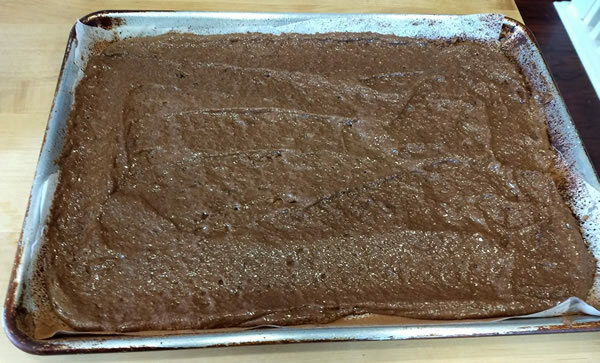 Next you spread the batter out into prepared sheet pans (covered with parchment paper and then greased and sprinkled with cocoa powder). Here is mine. It looks kind of sad. My sisters was a much lighter color and filled her sheet to the rim, so clearly one of us had a misstep, and considering which of us has had prior training, I’m guessing it was me! Then it goes into the oven and bakes for 6 minutes, and as soon as it’s out, you immediately dump it out of the pan onto a clean kitchen towel that’s been sprinkled with cocoa powder. Hah. My sister was frantically warning me ‘cut the corners!’ so the cake wouldn’t stick to the pan, but, uh, see above for why that was not remotely an issue for my cake. After it’s onto the dish towel, you roll it up right away, apparently so that the cake then has the ‘memory’ of the roll once it’s cooled. Which sounds really really weird to say but totally works. While that cooled on the counter, then we made the fillings. My sister made two fillings – one peanut butter and one caramel, but I stuck with just the peanut butter filling, which is really just peanut butter buttercream. It is, by the way, insanely delicious and I was a Very Loving Wife when I let Richard lick the whisk attachment after I was done instead of keeping it all to myself, even though I was VERY VERY tempted. So once the cake is cooled, then you unroll it, *carefully*, and fill it. Because we were making tiny rolls, we first cut the cake into quarters, and then filled each one individually and rolled those up. I did not, for some bizarre reason, take a picture of them pre-rolled, but here they are, after being rolled up, and before going into the freezer to chill. I am quite pleased to report that there was minimal cracking on any of my rolls! I know this is an issue because every time there is a rolled cake challenge on GBBO, someone has a massive cracking failure, so hooray for the lack thereof! Also, if some pieces fell off the ends, well quality control is important and the cake tasted quite fine. After the cakes were chilled enough that the filling was firm inside, then we cut them into pieces. Aren’t they pretty? I totally didn’t make sure to turn them all so that the nicer side face the camera, nope, not at all. The final step was ganache, so we heated up cream (or in my case half and half, because that’s what I had in the fridge) and poured that over chocolate and corn syrup, and whisked that together until it was smooth and lovely, and then poured it over the little cakes. The recipe called for dunking each cake individually but that seemed like a lot of hassle, and I was worried there would end up being too much chocolate and the peanut butter flavor would be lost. So instead I just spooned it over the tops of mine, so the pretty swirls were still visible (well, except for a few drips), and then sprinkled them with chopped peanuts. Also when one is the baker and there are trimmings and leftover filling and ganache, one *has* to do more quality testing. For..um..science. Many yummy noises were made on both sides of the camera. So many. Here we are with our finished rolls! This is from my sister’s side of things, because I had to use both hands to hold up my tray, and she was thus the only one with an available hand to work the camera. And how, you might ask, do they taste? SO VERY AMAZING. The peanut butter filling is very light and fluffy and really helps counteract the dark chocolate of the ganache and the cake. Five stars, would totally make again some day when I have lots of hours to spare and don’t mind turning the kitchen into a cocoa-powder-coated disaster zone again. This entry was posted in Baking, Baking Sisters, Life. Bookmark the permalink.